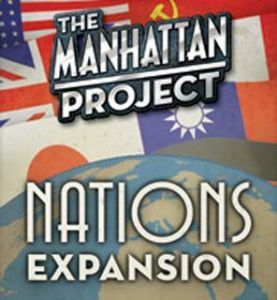 The 7-card Nations Expansion for The Manhattan Project allows each player to play the role of a real-world nation (Britain, China, France, Germany, Japan, Soviet Union or USA) in the race to build the bomb! Each card is essentially a "building" that is immune to Air Strikes and Espionage. This allows each nation to have its own unique ability throughout the game.